Graze.com have an interesting take on snacking in the office. Most of us seasoned office workers have a curious attachment to a vending machine of some type, normally filled with various types of confectionery, crisps and maybe a couple of different types of painkillers. I’ve always thought the fact that our employer sells us painkillers via the vending machine deeply unsettling. The food available to the average office rat is not that good. I’m lucky enough to have access to a very, very good staff restaurant, and I bring a lot of fruit in to snack on, but many don’t, which is where Graze.com comes in. 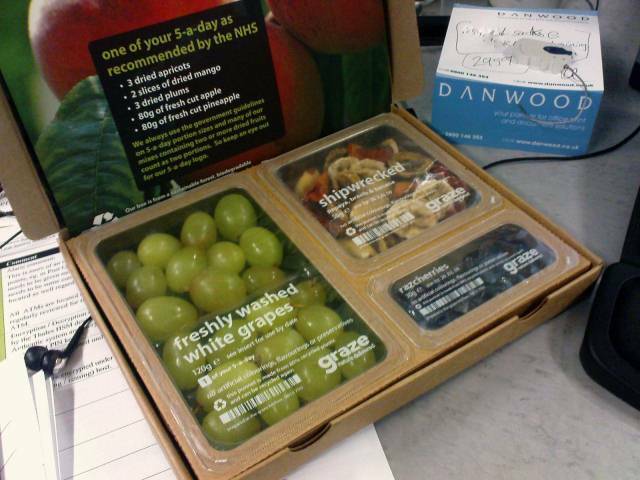 For a few quid, Graze will deliver a box of healthy snacks directly to your desk on a regular basis. Have a look at the photos on the Graze site, which explain the concept perfectly. Great idea, so I tried it out. My box contained white seedless grapes, which were fine if a little uninteresting, a portion of dried fruit and nuts called ‘Shipwrecked’ that had some beautiful big Brazil nuts, dried papaya and dried banana, and some ‘Razcherries‘ – big cherries soaked in raspberry juice. The dried banana was tough and a bit dry, but the razcherries were juicy and quite superb. I ordered a second box for Jen, and she fared better, receiving a big portion of sliced fresh pineapple, a trail mix of Brazil nuts, seeds and beautiful, plump dates that must equal anything bought in a Moroccan souk and some incredible wasabi coated peanuts. The wasabi exploded on the tongue, providing an instant shot of heat which disappeared within a second – interesting and exciting food, and a great balance of flavours and snacks. The boxes have too much packaging, a fact immediately seized on by the office eco warrior, and the price at £2.99 per box is too steep for a Yorkshireman to bear for a tray of grapes and some mixed fruit and nuts. If you organise yourself properly, you could easily eat like this at work for a fraction of the price through simply buying stuff elsewhere, but that misses the point. There is huge excitement and novelty about receiving something like this through the post, and it’s undoubtedly convenient, providing me with two of my five recommended portions of fruit and veg with zero effort on my part. Graze.com itself is a superb website, an easy place to navigate and manage your orders. You can tell them what you liked and what you didn’t, so I could easily steer future orders away from the grapes and onto something more exotic if I wanted. I’ll buy a box occasionally in the future, but I’ll also probably use Graze.com to send cheap little unexpected gifts to people when I need to. A Graze box would make an excellent little thank you/sorry, forgot your birthday/I love you type gift, for example.